I think we can all agree that there is something comforting about pasta. I knew it as macaroni or noodles while growing up, but after my daughter and then a grandson married into Italian families, I found there are many other ways to use this versatile product. My late son-in-law’s mother was convinced that I would be happier if I learned to speak Italian, so I could cook like a native speaker. But son-in-law and an Italian friend did not speak the language, and both were excellent purveyors of spaghetti and related products. In fact when I requested their translation of a recipe, they both reminded me that they did not speak Italian. You might be surprised to learn that they were making lasagna in ancient Rome albeit not quite the same as it is made today. Dried pasta seems to have been invented in North Africa, and was useful on a camel trip through the desert. It was also a staple for sea-farers on long ocean voyages. It was probably brought to Sicily by its Muslim conquerors. In 1154 there was a thriving manufacturing industry near Palermo which exported its products to Muslim and Christian countries alike. By 1785 Naples had 280 pasta shops. Tomato sauce was not added until comparatively recently. The tomato. which almost surely came from Spain, was viewed with suspicion by many, including my father-in-law who said “it just doesn’t look good to me.” Of course he put sugar on scrambled eggs. The first mention of tomatoes being used in a recipe came at the end of the seventeenth century. How do I know all this? I confess I read it in a book. After collecting a shelf full of Italian recipe books, I became Italian. It was comparatively easy, starting with putting enough salt in the cooking water–sort of like sea water, to having enough water in the kettle to let the pasta roam around. My son-in-law’s mother said he never used enough water. I never told him, and his pasta was just fine. Contrary to what I knew before I became Italian, pasta doesn’t always come in long strings; and the flat kind lends itself to all kinds of wonderful dishes besides lasagna. We make a lot of our own pasta, but some time ago I picked up what I thought was a long box of spaghetti and found buccarini, a fat spaghetti with a hole in the middle ready to grab the sauce. I keep learning as I go. I am easily pleased, but Dr. A is convinced that it isn’t spaghetti unless it has red sauce. Some days feel as if they are spinning out of control. Apparently we still have the same number of hours in each one, but due to the number of jobs necessary to keep our heads above water, or far too much playtime, when dinner time arrives most of us at one time or another roll our eyes and lament the absence of an idea to place upon the dinner table. The “dinner hour” seems to have changed places too. Those who used to eat at seven, now eat at five. For some, the table itself seems to have shifted: TV trays, tea carts, and any number of quick change solutions take place in our busy society. Remember when your mother called you in to dinner, or supper, and you all sat at the same table at the same time? She had started dinner preparations early in the day, and probably knew three days in advance what she was serving. When the younger generation departs, they take with them the traditions of family dining. Gone are the ball game or music practice which kept dinner waiting on the stove or in the microwave. Now here you are, for better or worse, starving to death and nothing in your mind to keep the wolf at bay. We eat a lot of pasta, both home made and dry. It’s quick to fix comfort food. 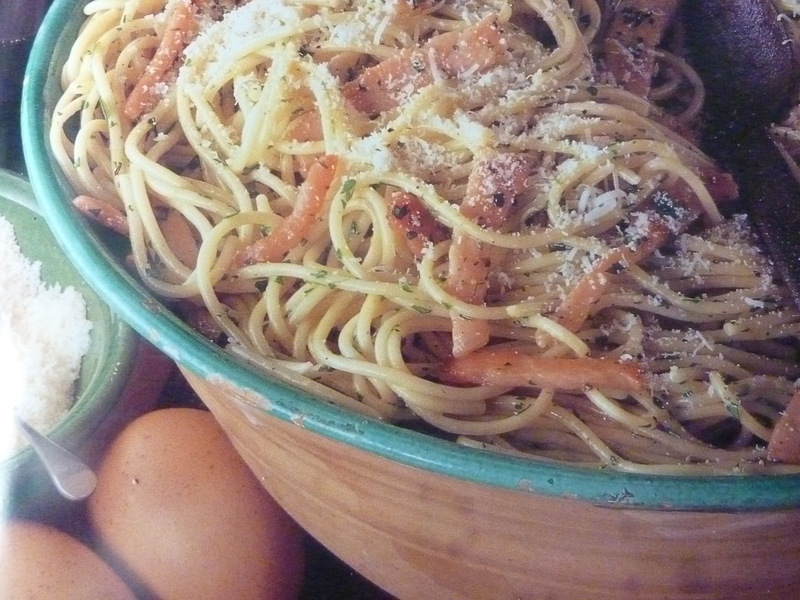 I make this pasta dish frequently and never tire of it. Fiddling around in the kitchen last night after coming home late I needed a sauce for a few frozen ravioli. I no longer can eat red sauce, so I’m always playing with other alternatives. For this one melted a couple tablespoons butter, added the zest of 1/2 lemon, then add its juice. Simmer about 1 min. then add about 1 cup white wine, cook about 5 min. add about 3 Tbs. sour cream or whipping cream and simmer till thickened. \Throw in a handful of parmegiano. Fry about 6 slices thick-sliced bacon cut into thin slices in a little bit of oil till golden brown. Add about 6 oz white wine, and reduce slightly. Keep warm while cooking spaghetti. Beat a couple eggs, add 1/2 c parmesan, a little olive oil, Toss the drained pasta into the egg and cheese then add the bacon mixture.. See? It only took about 5 min. except for cooking the pasta which took you 12 min or so. I am a retired fine arts teacher, sculptor/painter, writer, and a native Californian. I love my family,dogs, horses, movies, reading and music, probably in that order. I have been married forever to a very nice man who is nice to old ladies, dogs and children.